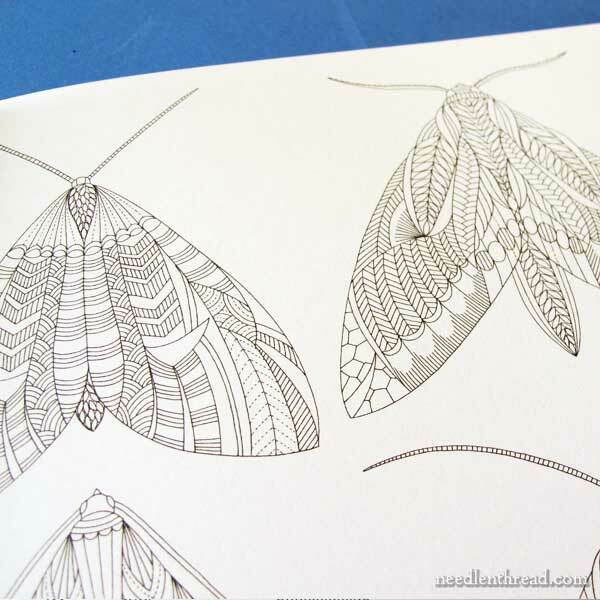 Coloring books are a great source for embroidery design inspiration. 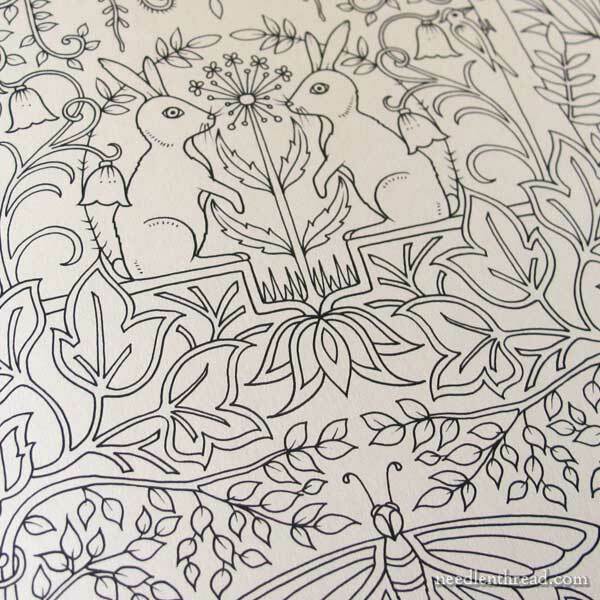 We’ve discussed this before a couple times – the Secret Garden Hummingbirds are an example of how a coloring book page can turn into an embroidery design. This is The Thing: we don’t necessarily all have the talent to draw well. We might love embroidery, we might yearn to embroider something other than designs in kits and the like, but we might not necessarily have the knack for drawing the things we might want to stitch. But an embroiderer can certainly take advantage of this Era of the Grown-Up Coloring Book. 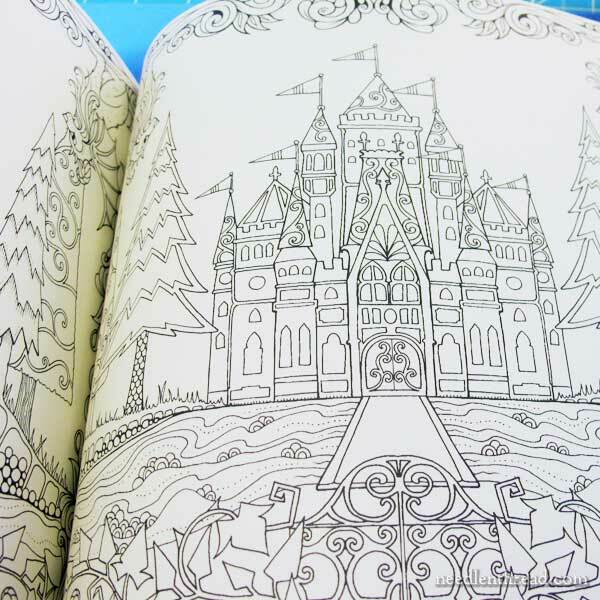 These advanced and intricate coloring books are wildly popular right now, and you can find many good ones by many different artists widely available today. If you purchase a coloring book, you can turn the designs in the book into embroidery projects, as long as they’re for your own personal use. There’s nothing wrong with this, and there’s no violation of copyright or anything like that. I’ve had questions about that with the Secret Garden embroidery: Do I have to write to the author or publisher to get permission to embroider a design in that book? The answer is no. If you buy the book, and if you’re using the design for personal use only, you can embroidery it, you can color it, you can etch it onto glass or carve it onto wood. You just can’t reproduce the design and sell it, or sell items made with the design on it. 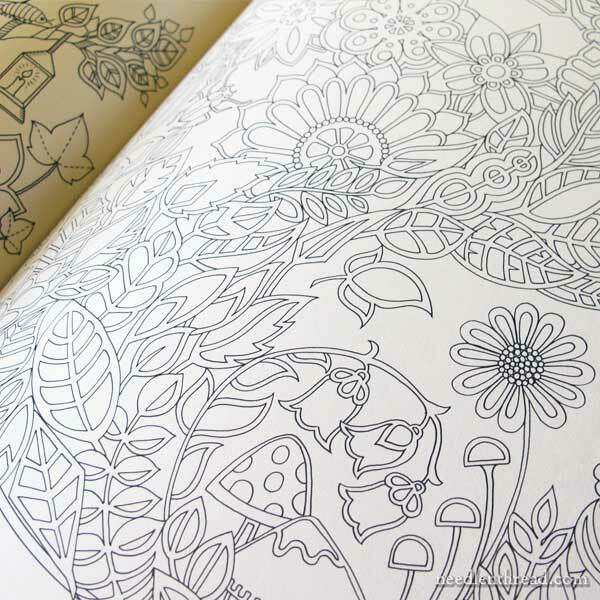 Here are two coloring books that you might enjoy using for embroidery designs, ideas, and inspiration. One is Johanna Basford’s second book (I reviewed her first book Secret Garden: An Inky Treasure Hunt here), Enchanted Forest; and the second is Millie Marotta’s Animal Kingdom. I’ll tell you what you’ll find in both of them, and discuss the designs a little bit from an embroiderer’s perspective. Both coloring books are excellent resources for the embroiderer. They are somewhat similar in style, and depending on your design preferences and the like, you might like one over the other – but they’re both equally adaptable for the embroiderer. 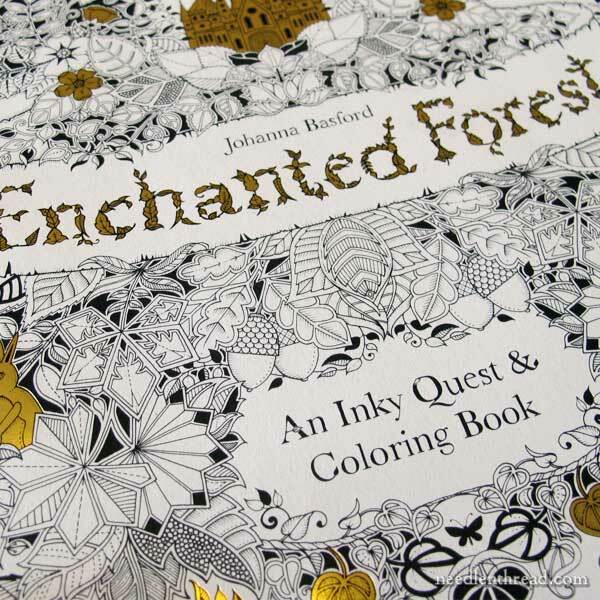 Like Secret Garden, Johanna Basford’s second book is an Inky Quest and Coloring Book. There are some differences, comparing the two books. Firstly, Enchanted Forest is printed on different paper, so it colors up a little better than Secret Garden. The paper has a smoother hand (or “tooth”) and it is heavier. Ink doesn’t show through, and sharp pencils don’t disturb the surface of the paper. Secondly, there’s no text on the coloring book pages. If you’re familiar with Secret Garden, you’ll recognize the design style here – lots of double lines on leaves and foliage – but you’ll also see more critters and the like as the focus of the book. You’ll also find large individual beasties like this bunny (a squirrel…and others) adorned with all kinds of Enchanted Forest foliage. These would make terrific stand-alone embroidery projects. Reduced in size, I could see them as embroidered journal covers, accents on a tote bag, even embroidered pillows and the like. It’s an Enchanted Forest, after all, so we have castles and forests – and the forests are abundant with all kinds of flora and fauna. You’ll find carpets of enchanted mushrooms and flowers and all the little critters among them. …and all kinds of other imaginative delights. 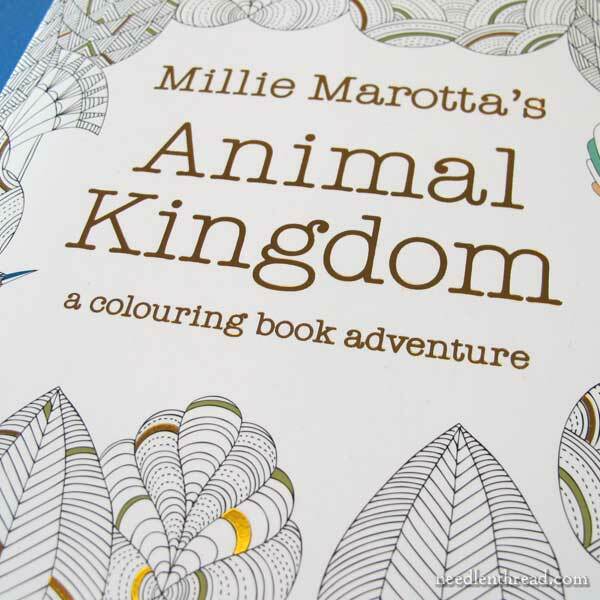 Now let’s take a look at Millie Marotta’s Animal Kingdom. 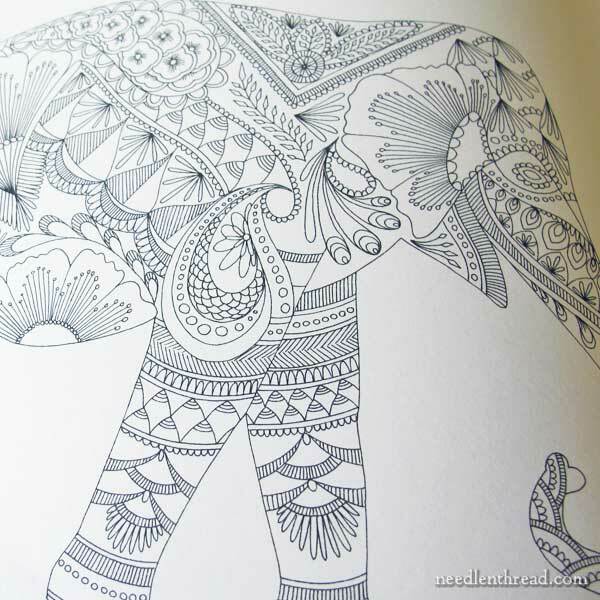 Published last year, Animal Kingdom hasn’t gotten as much buzz as Johanna Basford’s coloring books have gotten recently, but trust me – it’s equally enchanting! In fact, from an embroiderer’s perspective, you might find this book more of a must-have, if you like the idea of using coloring book designs as a basis for embroidery projects. Millie Marotta’s designs strike me as a little more textile-oriented, a little more adaptable to interpreting in needle and thread. Animal Kingdom also features plenty of flowers and foliage and little critters and bugs. The squirrels are vivacious – think of all the festive things you could do to them, with colorful threads, beads, and embellishments! And butterflies! Don’t forget the butterflies! And oh my goodness, she has these two terrific roosters in there, perfect for interpretation in crewel embroidery. Or other embroidery. I admit, I fell in love with them at first glance! If you can get your hands on either or both of these books, you’ll find plenty of embroidery inspiration in them! And you know what? They’re pretty fun to color, too! In the US can find Enchanted Forest available through Amazon. World-wide, Enchanted Forest is available through Book Depository on pre-order. If you have a local bookstore or even a Barnes & Noble or the like, you can probably find it on the shelves these days. Johanna’s books and the whole coloring book craze has been in the news quite a bit lately, so I’m betting you’ll find displays at local bookstores. Right now, the only place I have found Animal Kingdom in stock online is through Amazon UK. However, Animal Kingdom is also listed on Amazon US, and you can sign up for notification on its availability. This at least lets the publishers know there’s an interest in it – and you’ll have first dibs on new stock. Worldwide, Animal Kingdom is also listed at Book Depository and you can sign up there for notification when it’s back in stock there, too. 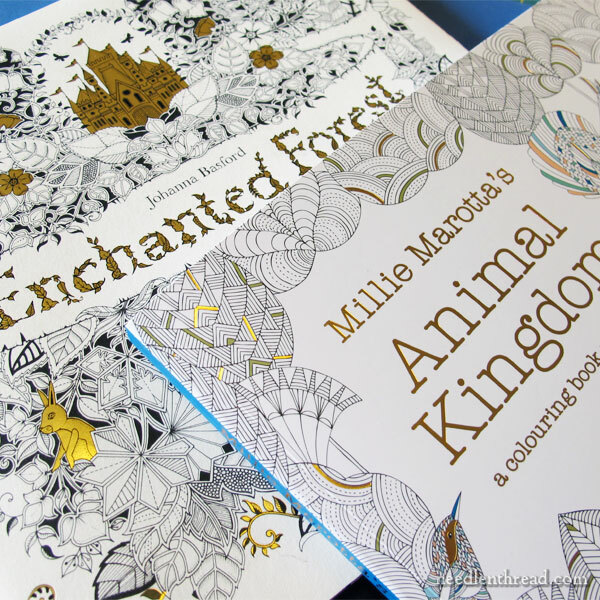 Both the colouring books of the Enchanted Forest and the Animal Kingdom seem full of inspiration for embroidery projects. The Animal Kingdom have some lovely ideas especially the elephant which is interesting and the butterflies are adorable and in the Enchanted Forest I love the castle and the air balloon. 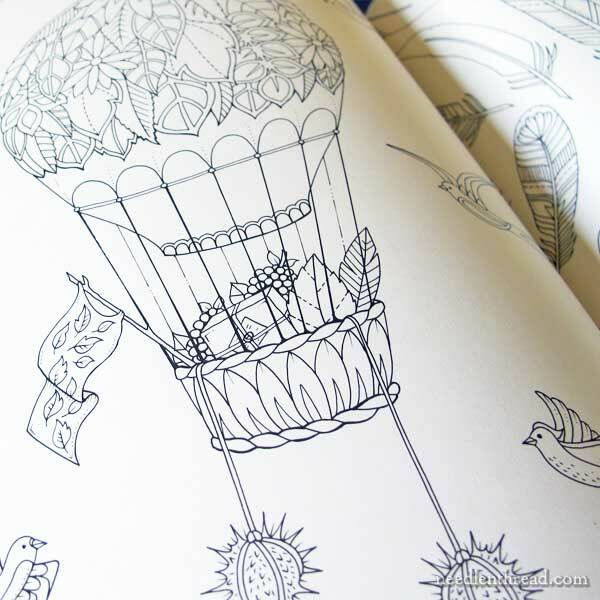 These colouring books are a great idea for embroidery projects. Thanks for sharing these with us and for showing the lovely drawings inside the books. Three recent articles on the subject of these books! I have both of these on my wish lists! I love coloring 😀 Dover has some lovely ones too. Dover, yes! And all of their coloring book pages may be reproduced for craft purposes, although not reproduced by any graphics company. They set the usual criteria of no more than four images from one book per project. Hi, Liz – it depends on the book and the author. It’s always worth checking their copyright info carefully. Ok, I’m sold. I’ll be adding these books to my needlework wish list for birthday/Christmas/anniversary/whatever gift-giving event is coming up next. These are great books for inspiration. I agree they would be excellent for crewel work. But, how to transfer the detailed design onto linen twill? Back to the ink jet idea. Maybe I would just have to use the type of linen you used and not linen twill. Or maybe I will just have to buckle down and try transferring it with the prick and pounce method. Maybe I’ll give that a try. They’re pretty easy to trace, if you are using a lighter linen. Hedgehog Handworks carries a beautiful, just barely cream colored linen twill that is lovely for hand embroidery, and it might take tracing well. I don’t think I’d put twill through a printer….but that’s just me! Prick and pounce would be quite detailed, but if you use a tiny needle for the prickings and make them close, you should be able to get a good, detailed transfer. 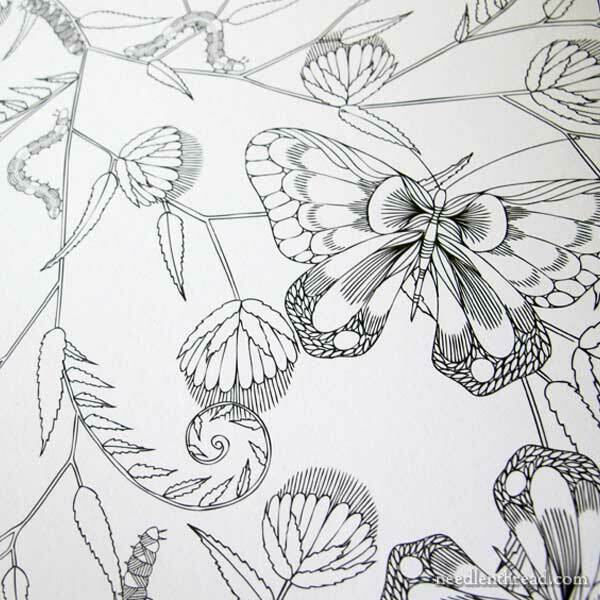 These coloring book pages remind me of Catherine Jordan’s adaptations of Zentangle to needlework. Animal Kingdom is currently in stock in the USA with Barnes and Noble, http://www.bn.com. I must, really must, have the fox by Millie Marotta. What a dear little design. I am going to have so much fun stitching that one. Thank you ever so much in drawing my attention to it. Now let’s hope my bookstore can get a hold of it. Millie Marotta’s designs (the ‘filling details’ in elephant, squirrels, etc.) have an Indian motif likeness to them ! These are lovely, but don’t you find all the detail in the animal designs in particular a bit too prescriptive? I’m no great designer, but if I were to work these I’d transfer only the outlines for the main regions and not the fine detail, and then fill them in in my own (less expert) way. PS: went to the Exquisite Threads exhibition at the National Gallery of Victoria in Melbourne yesterday – free entry, and well worth the time. Hi, Elaine – Yes, that’s pretty much the approach I’d take too, especially with all the fine lines! Would love to see the Exquisite Threads Exhibition – luck duck!! They are incredible books aren’t they? Although I admit I haven’t yet succumbed to Animal Kingdom I have had hours of fun finding all the things in Enchanted Forest. Sometimes I wonder if I have even begun to grow up but then I figure this is the sort of thing that keeps us young. Since I am bedridden a lot of the time, I do actually colour in some of these designs although I photocopy them first and colour the copy – can’t risk messing up the originals. I also visited the Exquisite Threads show this week and came home with the catalogue which is fascinating. It’s nice for us to have something like this for a change, it doesn’t happen often. I knew you would love the roosters they are just gorgeous and give an opportunity for applique on the bare feathers. What I like about the two books whilst similar they are not the same. Johanna’s book is a little more challenging in as much as you can use your own type of stitch to fill in. Millie’s help by being more specific as to what stitch could be needed. Whilst the drawings of Millie are large I think a beginner would find it a bit more easy as it shows ideas of how to fill an area. The Enchanted Forest with its fold over pages are great and I do like the dragon. It reminds me of the books that you could pull apart and build scenes. Or am I too old now for anyone else to remember those? Could copy and make one! With these books there is really something for everyone. Martha, I too remember the pull apart books, along with the books that had heavy weight dolls and lots of “clothing” with which to dress the dolls. One more question about using the designs. If I use the design for an embroidery or quilt project for my personal use but plan to exhibit the piece publicly, is it sufficient to list the source in the text that accompanies the item, or do I need to get permission from the publisher for public exhibition? I’d get permission, just to be covered! Just ordered this book. Have had the humming bird one since it first came out. Is a few others now too but ‘little by little, so grows the vine’, and the book collection! In a Hagar comic Mrs Hagar is showing a guest around the house. Is a tiny shelf on the wall with one book on it. ‘What’s that’? ‘Oh’, with nose in the air Mrs Hagar replies, ‘We’ve started a library’! Fantastic! Thanks for sharing that Mary. Wow…Mary…did you see that Joanna’s “Secret Garden” book is listed as part of Yahoo Makers! Today…4/10! I think this is incredible! You post this message to us yesterday and today the same book is headlined in Yahoo!!!!! Drat. I knew before I even read this post that my wish list was going to be added to. Thanks Mary – you’re SUCH an enabler!! I wasn’t quite awake yet (face still pressed into my pillows hoping the three dogs sleeping next to me didn’t realize I was awake) when my husband came in and announced that the top selling book on Amazon was a coloring book. Voice muffled by my pillows (I was hoping to continue to sleep) I said (from watching your developing Secret Garden) Johanna Basford’s Secret Garden. His ‘Yes!’ and ‘How did you know about a coloring book?’ awoke me enough to grab my nearby Mac and look at his latest blog post on his helping people to market their kindle books. I hope it is ok with you, I gave him your Secret Garden project url and ask him to add a blurb within his posting to tell people there is more to coloring books than enjoying them using pencils. He did so, changing the intro paragraph to his posting to include your url. 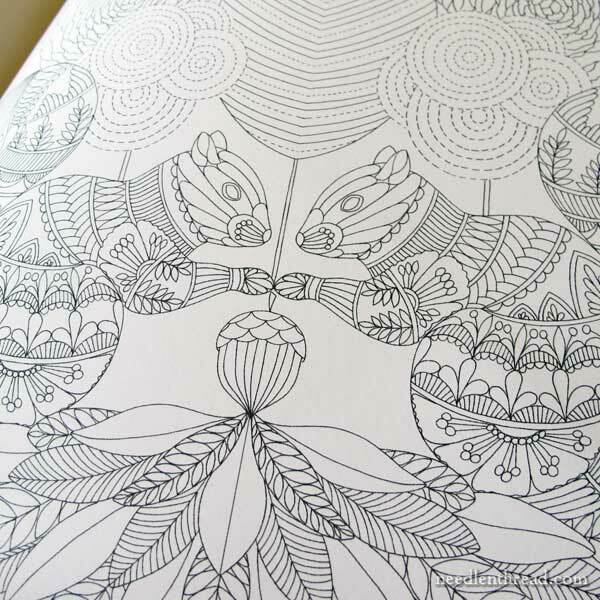 Take a look at mandala coloring books too. I wasn’t game to mention those and I have a few others that are great. Not as large prints but can be enlarged. I enlarge a few pages of some of the books and let my 4year old GS colour in and he also watches me so I give him a needle and wool to sew along the lines. Keeps him quiet but if he makes a mistake I have to print a new page as he won’t use the old one as it has a hole in it. I think I have set myself a tough job. Even telling him the old holes will remind him to take more care he then tells me he is only little and just started. Oh bring on the tea and paracetamol. Great minds think alike! 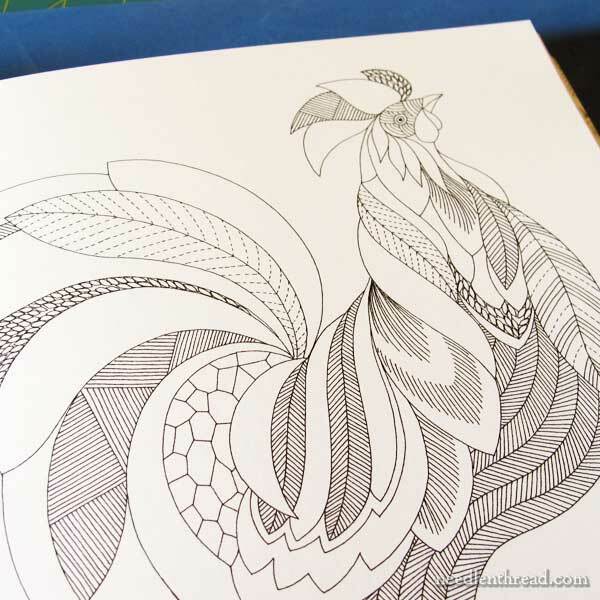 Coloring books are a wonderful source of patterns, for crewel and other styles. Dover’s series are fun. The “stained glass” and geometric pages work particularly well for inhabited blackwork (the kind with the diapered fillings). A good source of inspiration, especially for shading with satin stitch, is the Chinese floral watercolor. Many videos of such paintings being done in a few brushstrokes are on YouTube and the delicacy of the shading makes them prime embroidery material. The overall composition can be very simple. There isn’t always a vase and a table, but even without the painting can look complete. As in “less is more”, the wide empty space enhances the beauty of the subject. WOW! I have a slew of adult coloring books. I find them so relaxing to “play” with! That rooster screams blackwork to me. All those sections and a starting point for patterns. I’ll be on the look out for that book. 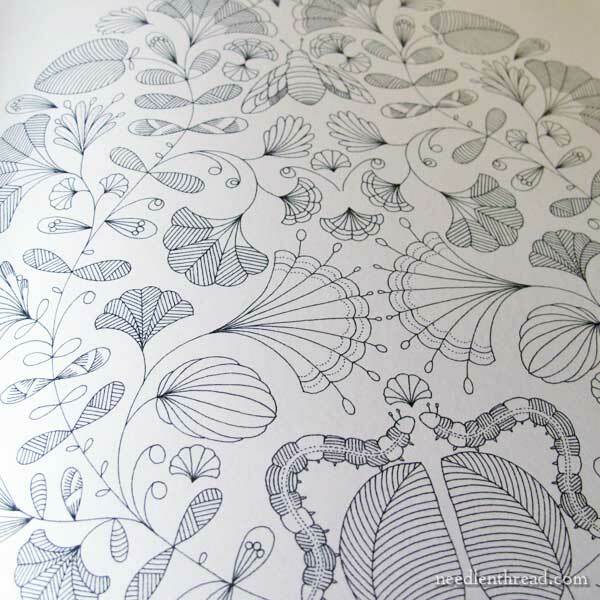 Is there a simple way of transfering these lovely coloring pages onto fabric? 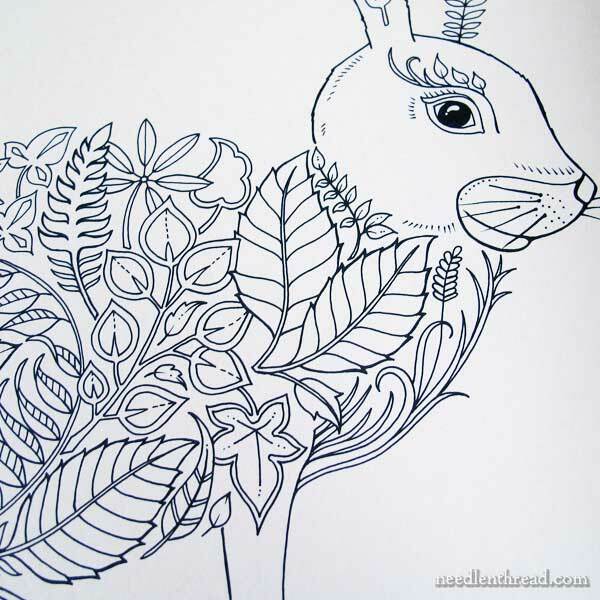 I have loads of adult coloring books pages that I would love to transfer onto fabric, but I am not really sure the easiest and the best way to do so. Hi, Stephanie – I’d print the page or photocopy it, and then trace over the design with an iron on transfer pen (on the back of the paper). I suggest Sublime Stitching’s fine tipped iron on transfer pen. Either that, or you can trace the design. They’re kind of complex, so I’d use a light pad to trace, rather than a sunny window, if you have one.